The 25ft beam on Destiny III creates comfortable interior space. 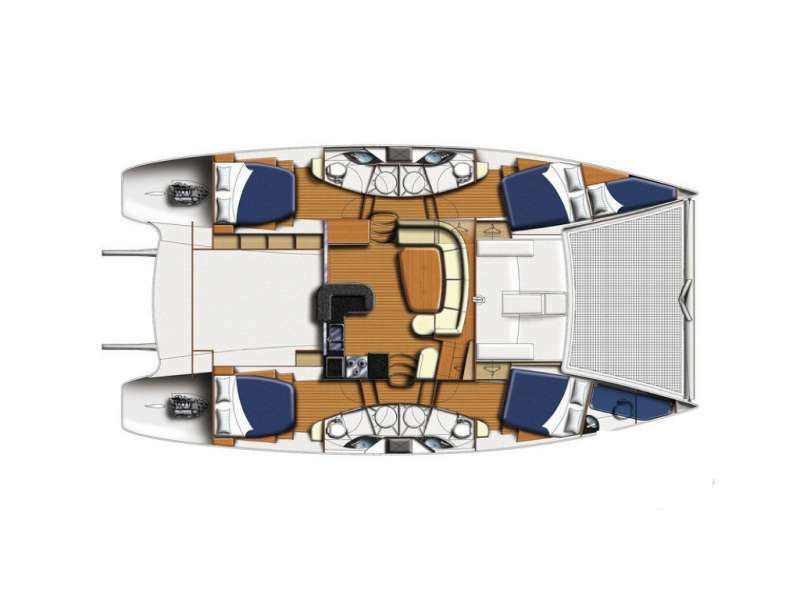 In the main saloon, the large banquette table with U-shaped seating comfortably accommodates the entire charter party for snacks, meals and board games. Open the large sliding doors from the salon to the cockpit to create one vast, social space. Destiny III accommodates six guests in three queen-berth cabins. Each cabin is en-suite, with separate shower stall and electric toilet. Cabins are air conditioned and opening hatches and portholes provide good ventilation. Destiny III is an excellent option for couples, friends and families who want to experience the Bahamas. Go sailing, swimming snorkeling, diving and exploring. Let the professional crew on Destiny III share the best of the best of this island paradise. Launch a vacation to remember! Destiny III uses solar panels for charging. Scott and Cara hail from the Miami area. While always enjoying the pleasures of the sea, they have been boating the waters of Florida, the Bahamas, and the Caribbean for over 40 years. Scott's part time job while in high school was as a mate on a fishing boat on Miami Beach. They both fled from their successful corporate jobs 16 years ago to move to the Virgin Islands and sail the Caribbean. After five years of chartering in the Caribbean, they returned to their home state of Florida. They have spent the last 11 years cruising and running charters in the waters of the Florida Keys and the Bahamas. In their off time, they are either traveling around the country in their antique Airstream trailer or riding their motorcycles. They also own a Bed & Breakfast in the North Carolina mountains. Scott and Cara are both U.S.C.G. Captains. They make for a dynamic team whose fun-loving strengths will ensure that you have the most memorable vacation of your life. They look forward to welcoming you aboard. Captain Dave Calvert has been sailing for more than 40 years. Over this time he has logged over 60,000 miles of ocean sailing on boats he has owned. In addition to this, Dave has been a world-class racer, winning over 14 National Championships on catamarans and trimarans. Dave also was crew of Steve Fossett's 125 ft. mega-catamaran, PlayStation. During 2001 and 2002, as a driver onboard, he helped to set five world records including both Trans Atlantic records and the 24-hour speed record. Dave has owned and operated Calvert Sails for over 37 years and continues to design and manufacturer world-class multihull and monohull sails. So, if you want to feel confidence in a skipper, Dave is your man. He is a current holder of a US Coast Guard captain's license with all Bahamas charter permits. Also, if interested in learning how to sail or cruise, Dave is always willing to let you help trim the sails and take the helm. With years of sailing the Bahamas islands, Dave and his wife Trish know these islands intimately and will make your Bahamas cruise one to remember. Trish Calvert is the first mate and chef aboard Destiny III. She has been sailing with Dave for three decades. During this time, she has also logged many thousands of miles along the US east coast, Florida Keys, The Bahamas, Turks and Caicos Islands, Dominican Republic and Caribbean Islands to Trinidad. She was a sailing instructor for windsurfing and Hobie Cats, running one of the largest water sports companies in the Florida Keys. She has a love of cooking and is well-known for her culinary creations. Contact us for rates and current availability or to book a charter aboard Destiny III! The layout includes one single and four queen-sized cabins with en suite heads, each with separate shower stalls and electric toilets. One cabin is reserved for the captain.